A human person is not just a biological being. He or she also has a spiritual aspect which animates the body. This spiritual element, though it remains unseen, plays a pivotal role in shaping human life. It infuses the work we do, the relationships we build, the family and society we live in, with meaning. In order to be complete human persons, we have to satisfy both these elements that are engraved in us: the biological as well as the spiritual. Neglect of either of the two creates a crisis – a depression. More so, when the spiritual element is neglected, life becomes mechanical and depressive. We know of ways to nourish the body but often times are unaware of paths to nurture the spiritual element in us. This pathway to nourish our spiritual life is called ‘spirituality’. And just as there are many ways to look after our physical body, there are a number of 'spiritualties’ to take care of our spiritual life. We have to discover which one is best suited to us. In this series of articles entitled 'Spiritualty for Daily Life', we will explore a spirituality based on the Ignatian approach. 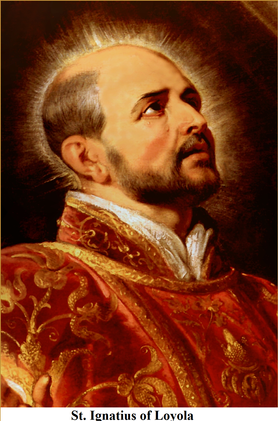 This is an approach practiced by the Jesuit Order founded by St. Ignatius of Loyola in 1540. Although the Jesuit Order is within the framework of the Catholic Church, Ignatian spirituality is intended for the widest possible audience of believers and seekers. Thus, one can be a Christian, a Hindu, a Muslim, a sinner or a saint, and yet find this approach extremely efficacious. The way of Ignatius is about finding freedom: the freedom to discover who you really are and what it is you have been called for in life; to make good decisions and to cherish the gift of life given to you; to love and to accept love; and finally to experience the beauty of creation and the hidden mystery of God Himself. The story of Ignatius begins with his passionate desire for worldly fame, glory and his goal of pleasing a charming princess in the early 16th century. As a Spanish soldier, he was wounded in battle in the year 1521 and was taken to a castle to recuperate. During his long and painful convalescence, he longed to read books on chivalry and romance. However, the only books available in the castle were on the lives of saints. He, nevertheless, read them and came to an important conclusion which led to his conversion. He realised that while reading about chivalrous deeds and romance made him happy, it was a hollow sort of happiness that brought temporary respite and generated ambiguity. Reading the lives of saints evoked long lasting happiness and a deep seated inner peace and joy. Here began his spiritual journey. Over the years, in order to help others in their spiritual life, Ignatius composed a retreat handbook titled The Spiritual Exercises. These exercises have guided numerous people since the 16th century to find meaning and purpose in their lives. The first principle and foundation of the spiritual exercises states that our primary purpose in life is to be with God forever – to praise Him, to revere Him and to serve Him. Everything else on Earth is created to be a conduit for us to attain this goal. Thus, our relationship with allother created things, material as well as spiritual (our ideas, opinions, decisions etc. ), including other human persons, is to use them in so far as they enable us to praise, reverence and serve God. When we fulfil this purpose in life we experience sublime tranquillity. As soon as we attach undue importance to created things and visualize them as an end in themselves, then our primary purpose in life is defeated. When materialistic tendencies gain ascendency we experience negative emotions in our lives. The Ignatian approach, which is spirituality for day to day life, is a way to free ourselves from inordinate attachments. These tend to build up over the span of our lives and include besides material things such as our belongings, our gadgets, vehicles, houses, etc., also other human persons (when we no longer respect him or her as a means to take us to God), and our ideas, opinions, decisions, culture, etc. We need not suppress our healthy attachments and desires. But awareness of what is disordered and detachment thereof is essential. This will aid us in living with profound gratitude for God’s gifts and in holding ourselves in balance so as not to bestow the worship due to God upon his creation.